Not only is this Wordless Wednesday, I'm also going to call it "Where I Wish I Was Wednesday" ! The Napa Valley. My husband Rob and I were lucky enough to spend last weekend in the treasure that is the Napa Valley. (See: Where We Spent Our Weekend Away). Have you been there? We visit as often as possible to renew our spirit - and enjoy spirits :-> When we first discovered our favorite location it was called Niebaum-Coppola Winery, located in Rutherford, CA owned by Frances Ford Coppola. The incredibly gorgeous building held artifacts from Coppola films, including Rob's treasured movie "The Godfather", and showcased historical items important to film making. The winery became a bit circus like, the focus wasn't on the wine basically, but that has changed. 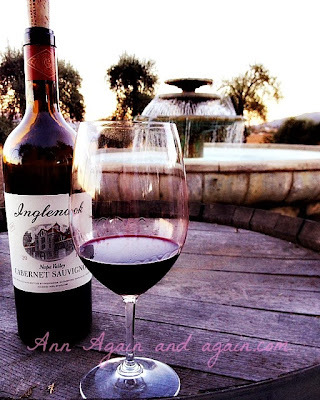 The winery is back to its original name Inglenook, the grounds are quieter, and the movie props have been moved to the Francis Ford Coppola Winery in Geyserville, CA. There are no signs to point you toward Inglenook, you have to know where to go, and let me tell you, you will want to go! And when you do, climb to the top of the hill (look for the fountain in the picture above) and just breathe. It's one of the best views you will ever experience.